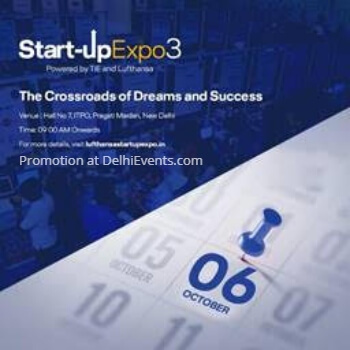 Co-created by Lufthansa India and TiE Delhi-NCR, Start-up Expo 2018, India’s largest ecosystem for start-up success, is all set for its third powerful edition. The Start-up Expo will see the convergence of more than 20,000 delegates from 175 cities across India, and is expected to include over 100 investors, 500 recognized business experts, along with 500 innovative start-up exhibitors. The Expo offers new entrepreneurs a platform where they can showcase their ventures, meet investors, engage with government organizations, attend knowledge sessions, receive one-on-one mentoring, network with business experts, explore partnership opportunities, find potential customers and interact with all the stakeholders that can help them scale new heights. The Start-up Expo is supported by Department of Industrial Policy & Promotion (DIPP), StartupIndia and Small Industries Development Bank of India (SIDBI).